ISLA COLÓN, Panama – It’s about 35 °C and the sun shines vigorously on Isla Colón, the main island of Bocas del Toro, Panama. Not the best moment for a bike tour during the hottest hours of the day, or so we discover. But my boyfriend and I are determined to make it to the so-called “Plastic Bottle Village,” created by environmentalist Robert Bezeau. 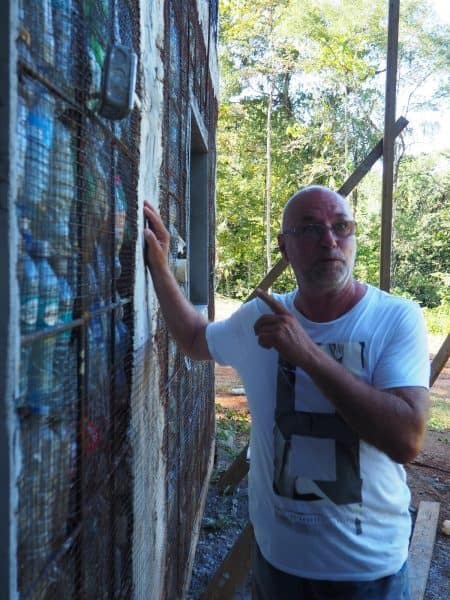 His village isn’t too difficult to find: signs describing the impact of plastic bottle consumption are located everywhere on the island’s main road toward Boca del Drago’s famous Starfish Beach. After a half-hour ride, we arrive at Bezeau’s property, tucked away on a hill in the jungle. He awaits us with some ice-cold beers in glass bottles, which we happily accept. Bezeau, 67, a French Canadian, left Montreal for Panama on his quest for warmth and sunlight in 2009. The archipelago of Bocas del Toro was already increasing in popularity by then. So Bezeau simply started picking up bottles. In an effort to join forces with like-minded allies, Bezeau started the Bocas Recycling Program in 2012. Soon his stash of trash was piling up. 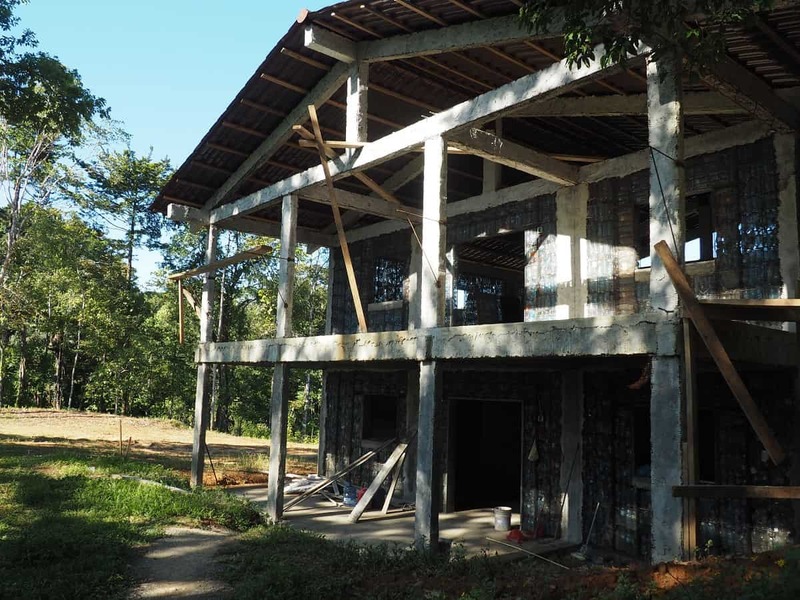 Bezeau and his team are working hard to construct an eco-residential community of some 120, all made out of collected plastic, spread out on 83 acres of jungle. As he guides us around the area, he notes that in only 13 months of work, the project has grown fast. We watch as construction workers build the entrance of the village, which looks like a castle. Three other buildings are near completion. Robert points out where he plans to locate the core of the village: a hilltop spot with a spectacular view. The first official residents of the village happen to be visiting as well during our tour. Jeff and Justine Catalano, who will one day live in one of these houses, are walking around the property with their three-month-old baby Jai. The Catalanos have been living on the island for a couple of years. After moving here from the United States, they opened the restaurant Taco Surf, which unites their passion for surfing and Mexican food. 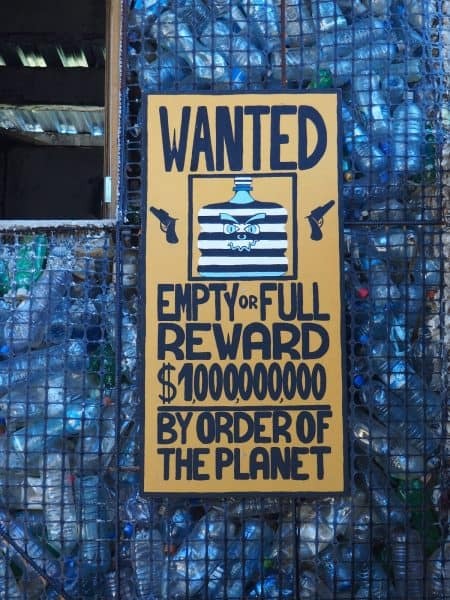 Since the bottles take hundreds of years to break down completely, with much of the waste consumed by fish and birds, thereby shortening their lifetimes, the impact is devastating, he adds. While using discarded bottles as construction material doesn’t prevent more bottles from being used, it does prevent them from entering animals’ habitats. We walk towards the biggest house, still under construction. The design gives a feeling of simplicity; its appearance doesn’t seem much different than that of a conventional house. The workers first put the bottles in a cage made out of used wire; next, they weld several cages to one another before they implement electricity and drainage systems. In the end, they cover the boxes with concrete. This big house contains some 22,000 plastic bottles. Reusing the bottles is more than an ecological boon – according to Bezeau, plastic as a construction material offers other surprising benefits, too. Bezeau also claims the houses are earthquake-resistant. Alongside the creation of this eco-village, Bezeau and his team are developing other ideas as well. For example, they are talking with a company that develops sustainable products in India. As I wrap my brain around that question, Bezeau rushes to his Mac in order to show me the current designs of the square bottles. They remind me of Lego blocks, evoking some Proustian memories. Robert’s biggest desire is to help transform plastic bottles into modern residences all around the world.